You typically do not create the route stack (or tree) yourself, instead you provide the instructions for ZF3 on how to do that. Above, in line 6 we have the router key, under which there is the routes subkey (line 8), containing the routing rules. You can specify which top-level route class to use (either TreeRouteStack or SimpleRouteStack) with the router_class parameter (line 7). If this parameter is not present, the TreeRouteStack is used by default. You can use the optional default_params key (line 11) to define the default values for parameters for all routes at once. However, you typically do not use this key and define the defaults on a per-route basis. We will show how you extract parameters from route later in this chapter. The name is used to uniquely identify the route. The type defines the fully qualified name of the route type (PHP class which implements the matching algorithm). The options is an array that includes the route string which should be compared against the URL part, and several parameters called the defaults. Above, the <route_name> placeholder should be the name of the route. A route name must be in lower case, like "home" or "about". The type key specifies the fully qualified route class name. The optional priority key allows to define the priority (which should be an integer number) of the route in the priority list (routes with higher priority will be visited first). If you omit the priority key, the routes will be visited in the LIFO 4 order. Routes having equal priority will be visited in the LIFO order. Thus, for the best performance, you should register routes that will match most often in the last turn, and least common routes should be registered first. 4) LIFO (stands for Last In, First Out) is used to organize items in a stack, where the topmost item, which is added last, is taken out first. The options key defines the array of route's options. We will discuss the options in the following sections of this chapter. // Add child routes here. // Add chained routes here. Looking at the two examples above, you won't see the explicit usage of Part and Chain route types, because (for your convenience) they are used by the ZF3 automatically when it encounters the child_routes and chain_routes keys in your routing configuration. In the configuration presented above, we have two routing rules listed in turn: first we have the "home" route (line 8) and then we have the "application" route (line 18). The "home" route maps the empty URL path to the "index" action of the IndexController controller. For example, enter "http://localhost/" in your browser to see the Home page of your website. This route is of type "Literal". 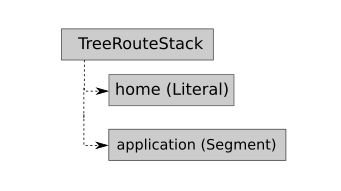 The "application" route (of type "Segment") maps URLs looking like "http://localhost/application", "http://localhost/application/about", "http://localhost/application/news", etc onto the corresponding action of the IndexController controller. The actual action name is determined by the "action" parameter. The default value for this parameter is "index". That means that if you do not specify any action, the request will be dispatched to "index" action. In the next sections, we will provide some examples on how to use the route types in your website.